IRI – International Research Institute for Climate and Society | Why do ENSO Forecasts Use Probabilities? Let’s take the example of the bar chart above, showing the latest forecast probabilities for the three ENSO categories for 3-month periods going out to early 2015, issued by CPC/IRI on June 5. How should we interpret this chart? When people envision random chance (“we don’t know”), they may think of a two-sided coin flip, with each side having a 50% chance of occurring. However, in the case of ENSO forecasting there are three possible outcomes: El Niño, neutral, and La Niña. Imagine a coin with a very thick edge, so that the chances of getting heads, tails, or having the coin land on its edge are all 33.3%. For any random coin toss—any given season we might consider—intuition might tell us there is a 1 in 3 chance of it being an El Niño season. 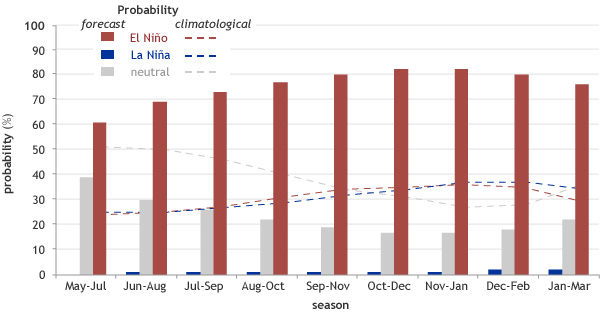 This seasonal difference in the climatological probabilities of El Niño or La Niña is related to the fact that, during fall, the year-to-year variability of the sea surface temperature (SST) in the Niño3.4 region is usually larger than it is in the spring, so that excursions below -0.5C or above 0.5C are more frequent in fall. This seasonal change in the amount of variability is consistent with the fact that that spring is often the time of year when El Niño or La Niña events are either at their very beginning or have just ended, so the SSTs tend to be closer to their average, while during fall and early winter, ENSO events are in full swing and typically peak.